I have always loved November. As far back as I can remember, my three favorite months of the year have been September, October and November. Call me strange, I don't care. I embrace strange. I embrace fall. All of it. November is a month of bare trees, allowing me to see through them to the orange and pink glow of the setting sun. The fallen leaves are now crunchy underfoot, and thickly carpet my path. Shuffling is the preferred gait of November. November is warm sweaters, and mittens and scarves. The smoke of burning leaves weaves a magical fog through the bare trees, suspended in the air somewhere just above your head. 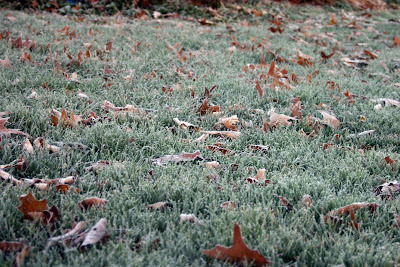 November is a heavy frost and crunchy grass in the morning, and sun-warmed soil in the afternoon. The November sunsets are some of the finest of the year. Colorful, brilliant, deep, meaningful. Sunrises are rays of gold reflecting on the last of the dead leaves clinging to bare branches. November is Thanksgiving, and family, and a season of counting your blessings. November is snuggling under blankets while watching TV in the evenings, and sipping hot chocolate, and slippers. I've always loved you, November. Welcome back. Beautiful! If only spring came next. I'm a wimp. I loved the post, because November is my very favorite month of the year too! It means baking and family, and my birthday and the begining of Christmas Music, I never start decorating until after thanksgiving but I love the music of Christmas. I love everything about the season. I also love November. And the fall. The leaves are just beginning to fall off my maple tree. Its beautiful. However my neighbor is not too happy about it. I saw her blowing them back into my yard with a blower. I feel the same way you do, but, the last time I had a real November was better than 15 years ago. Here the leaves never change and the weather is hot as usual. Bring lots of shorts, tees, and sandals when you guys come to Disney, you'll need 'em! Isn't it wonderful to have four distinct seasons? I love how God has created change for us! Can I trade you June for November? I would happily give up November for another June. Oh I am not a big fan of November (and don't even get me started on January and February). I really love June, July and August! Very well written, and I feel pretty much the same way. November and December are my two most favorite months of the year, unfortunately they are followed by January and February which are the most depressing months, ever! I get into a serious funk, starting immediately after the kids open up their Christmas presents, but I do love the next 52 days the most! And it's also Kessa's birthday month! However living this far south has taken the fall-ness out of November and it's just a little bit cooler than any other month of summer. yeah me too. that would be a big ditto.